Big name for big flavor! I was truly surprised at the bold, creamy, crunchy and savory flavor in each bite. Sometimes pasta dishes taste a little bland. Not this one. With a little easy preparation, this can be a quick and easy weeknight dish. I found this recipe posted on Tasty Kitchen and I’ve tweaked it just a little bit. This can be made in two parts. First you roast the tomatoes and garlic, long and slow, in a warm oven. Since this takes about 3 and a half hours, you can make this ahead of time and store in the refrigerator until you’re ready to finish the dish. Slice your grape or cherry tomatoes in half so the cut side is up. Drizzle with olive oil, sprinkle with a touch of sugar and add salt and pepper. 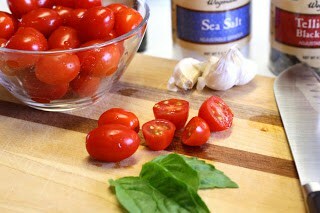 Sprinkle the fresh cut basil on top and add 3 cloves of garlic (peeled) in between the tomatoes. Pop them in the preheated 225 degree oven for about 3 1/2 hours. I will be using this recipe in a lot of dishes this summer. We’re always overrun with grape tomatoes from our garden. 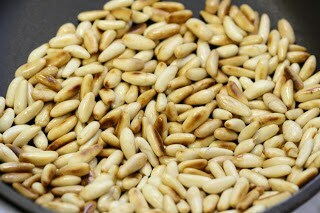 Toast your pine nuts in a dry skillet until lightly browned. Then gather the remaining ingredients. 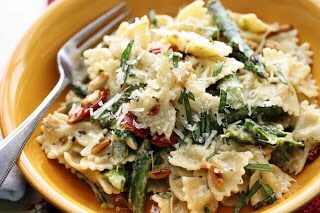 You will need fresh asparagus, salt, pepper, lemon & pepper seasoning, olive oil, bow tie pasta, the toasted pine nuts, fresh basil, Garlic & Herb Boursin Cheese (oh wow this is yummy stuff), and Parmesan cheese. 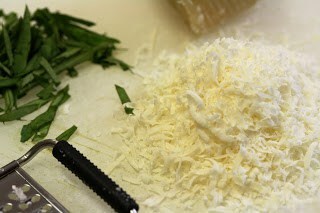 Grate the Parmesan cheese and slice the fresh basil. You’ll need about 1/4 cup of the Boursin cheese. You’ll be tempted to add more but don’t. This cheese has a very bold flavor and more is not needed. 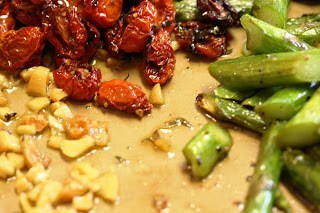 Once my tomatoes came out of the oven I removed them to a bowl and used the same pan to roast the asparagus. 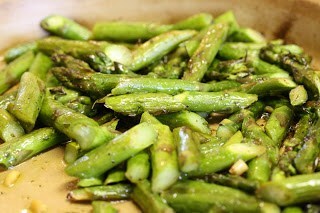 Turn the oven up to 425 degrees add the cleaned and cut asparagus and toss to coat in the olive oil left in the pan. Add more EVOO if needed. Roast until crisp tender, about 10 minutes. While the asparagus is roasting, boil your pasta until done. Drain the pasta reserving 2/3 cup pasta water. Chop the garlic that was cooked with the tomatoes. 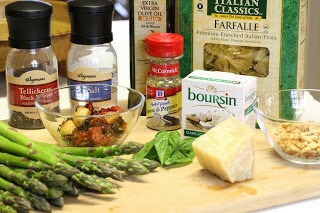 Add the cooked pasta back to the pot it was boiled in, add the reserved pasta water, roasted tomatoes, asparagus, garlic, pine nuts, lemon pepper seasoning, salt and pepper (to taste), and the Parmesan and Boursin Cheeses. Toss until well mixed and serve! Top with a little extra grated Parmesan and fresh basil if desired. Preheat the oven to 225 degrees. 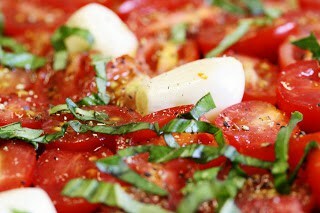 Place the grape tomatoes, cut side up, in a roasting pan and drizzle with olive oil, sugar, salt and pepper. Add the whole peeled garlic and sprinkle with basil. Roast for 3 1/2 hours. 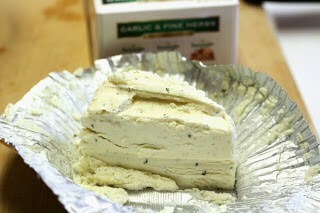 Refrigerate for later use if not finishing recipe now. If you’re finishing the dish now, add the asparagus to the same pan used to cook the tomatoes. Toss with any olive oil left in the pan or add more if needed. Roast in a hot 425 degree oven for about 10 minutes, or until crisp tender. While the asparagus is roasting, toast the pine nuts in a small dry skillet until lightly browned. Boil the pasta according to package directions. Drain reserving 2/3 cup pasta water. Add the pasta back into the pot, along with the pasta water, and all other ingredients. Toss to combine. Garnish with a little Parmesan cheese and basil if desired. Thanks a bunch for stopping by! Hope you have a lovely weekend and bake up something fun. Check back Monday for pie number 25! Thanks Karen! I haven’t made this dish in a while and have been thinking about it. So much flavor, and pretty too! Enjoy and thanks for trying our recipe.